This project required me to brand a specific client. I found this to be a fun project because I love working with children and branding for them is right up my alley. I decided to go for a very bold look. I chose orange and green. They are very childish colors and very fun. They also communicate the state of Florida. I picked Abadi for this project’s typeface and I think it’s highly readable, yet fun and attractive to the eye. I used lots of vivid imagery and color in my layouts. I went for a very graphic display. A non-profit organization promoting healthy eating habits for Kids of all ages. We would like to engage parents and kids equally. We want to create a website that will allow for teachers to use this for school project inspiration,have a place where the best nutritionists and doctors can share articles and information, and where cooks can share recipes and tips for healthier diets. We want the identity to be fun and inviting, while sophisticated and current. Good nutrition is essential for good health. 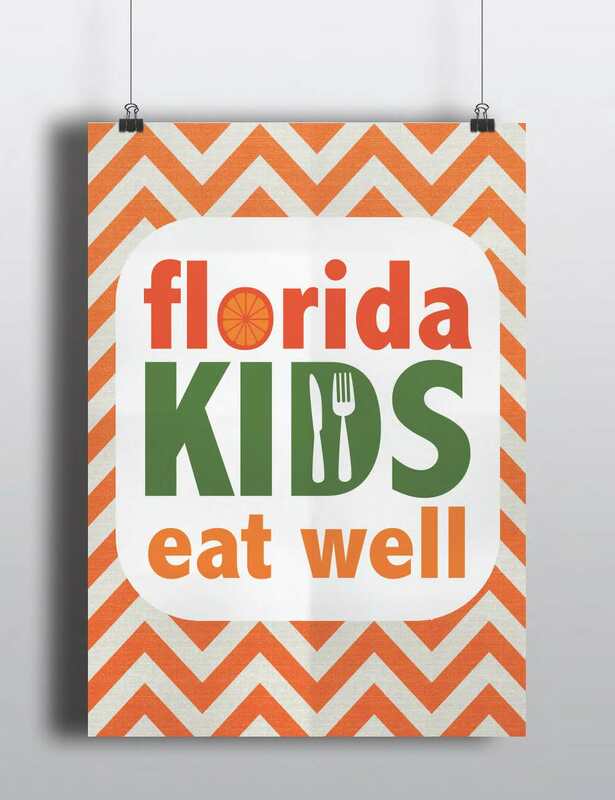 We believe strongly that Florida’s children can be on their way to healthy lives. Poor nutrition can lead to serious consequences which we can already see happening, so it is our goal to help promote healthy eating habits that will reverse the current patterns.